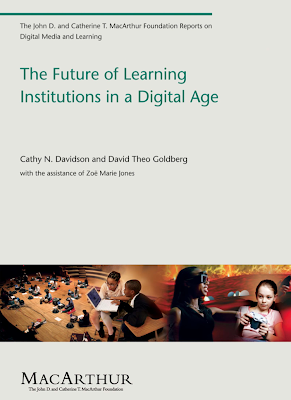 Yesterday I stumbled upon The Future of Learning Institutions in a Digital Age report by Cathy N. Davidson and David Theo Goldberg and the assistance of Zoe Marie Jones funded by the MacArthur Foundation, which was posted on the Creative Commons blog back in June 2009. I really can't begin to put into words how much this report has captured my excitement and my creative juices. It's a great way to start the new year! Over the past several years, I've found myself aligned with K-12 bloggers and educational theorists who seem to be light years ahead of higher education in keeping their finger on the pulse of learning trends of young students and stressing the critical need to shift our tools and pedagogies to engage and educate this new generation. And, may I add, that I've learned tremendously from them! However, what has amazed and frustrated me is the fact that this "new generation" of Millennial students that are generally the focus of new learning studies and new approaches to pedagogy is now entering their 30s. That's right -- several graduating classes of Millennials have already cycled through our colleges and universities and we, the pontificating professors holding all the answers, are just beginning to rub our eyes and realize that a semester in our disengaged lecture halls offers fewer learning moments than a five minute customized search on YouTube. My 21-year old nephew is currently a senior at the University of California. Last year he received a very high GPA and in a casual conversation, I congratulated him on his academic achievements. Then I asked, "Did you learn a lot?" He paused, placed his hand on his chin and reflected for a moment and said, "Yeah, yeah, I did. I learned how to memorize and how to figure out what my T.A.s expect me to know for the tests." Terrific. I encourage anyone who is reading this blog post to have a similar conversation with a young person you know enrolled in college today. And, hey, drop me a comment and let me know what they say. "Our argument here is that our institutions of learning have changed far more slowly than the modes of inventive, collaborative, participatory learning offered by the Internet and an array of contemporary mobile technologies. Part of the reason for the relatively slow change is that many of our traditional institutions have been tremendously successful, if measured in terms of endurance and stability. It is often noted that, of all existing institutions in the West, higher education is one of most enduring. Oxford University, the longest continuously running university in the English-speaking world, was founded in the twelfth century. Only the Catholic Church has been around longer and, like the Catholic Church, universities today bear a striking structural resemblance to what they were in medieval times. As is typically the case in the present, the medieval university was a separate, designated, physical location where young adults (students) came to be taught by those, usually older and more experienced, who were authorized (scholars, professors, dons) to impart their special knowledge, chiefly by lecturing. Over the years, such features as dormitories, colleges, and, later, departments were added to this universitas (corporation). The tendency toward increasing specialization, isolation, departmentalization, and advanced (graduate and professional school) training developed in the wake of the Enlightenment, gathering steam through the nineteenth and into the twentieth century." "includes the many ways that learners (of any age) use new technologies to participate in virtual communities where they share ideas, comment on one another’s projects, and plan, design, implement, advance, or simply discuss their practices, goals, and ideas together." Any individual who has a young person in his or her life or spends much of his/her time online understands this concept clearly. My son demonstrated it to me most clearly at age seven when he was both passionately learning about Pokemon and when he received his first digital video camera for Christmas. While I was expecting him to immediately use the camera to record his surroundings, the first thing he did was record himself playing his Pokemon video game on his Nintendo DS (he recorded the screen). His objective was to record the capturing of a specific Pokemon which, apparently, was quite an accomplishment. He then requested my assistance in uploading it to YouTube. We logged into our family account and I uploaded it for him. I watched in amazement. Within hours, the comments began to pour in. Users, other Pokemon players, began to ask questions about how/where/when he captured the character. My son eagerly responded to an inquiry or two. YouTube had been his community for learning how to play and interact with the Pokemon game and he felt the obligation to participate, to give back to that community, once he was able to do so. Today we have fifteen videos in our family YouTube channel. Fourteen of these videos have been viewed anywhere between 3 and 288 times. However, the ONE video that is related to Pokemon (all the others are videos of my family or videos of vacations we have been on) was viewed 5,622 times and it has received 22 comments. Hmm. I think you see where participatory learning is coming into play there. The point here is that college learning experiences are still based upon a straight forward exchange of information, rooted in traditional hierarchies of professor-student roles anchored in physical classroom spaces. While our digital learners have been molded in a society that fosters participatory learning in informal environments -- encouraging participation, input, reflection -- their formal learning in college demands them to learn in entirely different ways that are foreign to them. Even when learning occurs online, rarely is that learning transformed into participatory learning experiences. I have often imagined how dismayed students must be by this experience. I picture students in front of their laptops with multiple browsers open -- one of them being "Blackboard" or some other disengaged LMS, containing a course designed entirely in text, in which they're required to enter to learn english or philosophy or physics, while the other windows hold dozens of connections to individuals around the world, interactive games, opportunities to author and publish their thoughts through their blogs, etc. Because of the fact that online classes embrace the internet as the medium of the learning experience it seems incredibly unjust to transfer traditional pedagogies into this method of learning. If, instead, we view the Internet as an institution of learning with participatory learning at its core, as the MacArthur report encourages us to, then we are beginning to move into a new terrain, a new discourse. On a more personal note, my interests in encouraging new ways of thinking about learning in our digital society is taking me into a new direction in 2010. 2009 was professionally surreal for me, as I ended up resigning from two full-time positions in higher education. One was a tenured faculty position at a community college that I had held for seven years, a position that I learned tremendously from and had grown out of professionally. And the other was a management position at a four year university that I had hoped would lead me to opportunities to foster more teaching and learning innovations with faculty. Why in the world would I resign from two positions in the midst of economic crumble as I have colleagues around me who are preparing for lay offs? I know, it does sound a bit "plucky" (an actual reaction from one of my colleagues). I can honestly say that teaching and learning will always be my passion. And, sadly, that's why I left higher ed. After years of reinventing my own teaching, carving new learning spaces for my students and receiving exceptional feedback from these students about the quality of their learning ... even winning the national Sloan-C Excellence in Online Teaching Award, I needed to find another, a better way, to contribute to changing our institutions of learning. That's why I left. Today, in the dawn of 2010, I begin my adventure as an entrepreneur and educational consultant for my new business, Teaching Without Walls: Life Beyond the Lecture. I hope to leverage my experience and share my teaching ideas and resources with other educators. The validation of participatory learning and critical need for higher education to bend and morph in the face of new pedagogies of learning is breath of fresh air. Where will this lead us as professors, as administrators, as support staff of institutions of higher education? What does participatory learning look like exactly? How shall it be measured? We don't know exactly. And this is also something the report is honest and lucid about which I think all educators will appreciate. We do know that we're in this together and we need everyone to embrace these new ways of thinking about learning in order to best meet the needs of our students today and prepare them for a successful life in our digital society. Let's embrace this amazing shift and experience the new opportunities that await. Thank you to the MacArthur Foundation for funding the report -- I look forward to seeing the effects. I also hope future studies will include community colleges in the frame of "higher education," as two year institutions are critical stakeholders in ensuring students of all socioeconomic backgrounds have access to college. I didn't see any community college professors included on the list of collaborators and I believe CC professors have unique perspectives on the learning needs of diverse student populations (as it relates to open access to education). Michelle, great post - I really like the story about your son. Michelle-Good insightful learning.A great post which is truly motivating. Thanks for sharing the Mc Arhur Article. It seems that you picked up a lot of ideas when reading the report, congratulations!